Summer isn’t even over yet, but with Labor Day weekend upon us, there’s already a little bit of fall in the air. Shadows are growing longer, nights are cooler and soon, instead of picnicking, we’ll be tailgating. There’s another September tradition worth mentioning: Oktoberfest, the German celebration of beer and all the wonderful food that accompanies it. Everyone loves Oktoberfest. Who doesn’t enjoy drinking beer and eating sausages? (Not that we really need an excuse.) But why is Oktoberfest celebrated in September instead of its namesake month, October? Officially, Oktoberfest was first celebrated October 12 – 17, 1810, to celebrate the marriage of Prince Ludwig of Bavaria. Unofficially, Oktoberfest had been celebrated since the fifteenth century when it became customary to empty all the beer barrels for re-use in the upcoming brewing season. What better reason to drink up all that leftover beer? Within a few years, Oktoberfest was moved forward one month to mid-September, presumably to take advantage of warmer weather. Since then, the celebration has taken off and while Munich, Germany is considered to be the center of the Oktoberfest universe, it’s happily celebrated around the world. Whatever the reason, we’re also happy to share in the festivities by presenting this hearty dish with roots in traditional German cuisine. Sausage, beer and mushrooms figure prominently in German cookery and are three of our favorite food groups, so why not enjoy them all together? 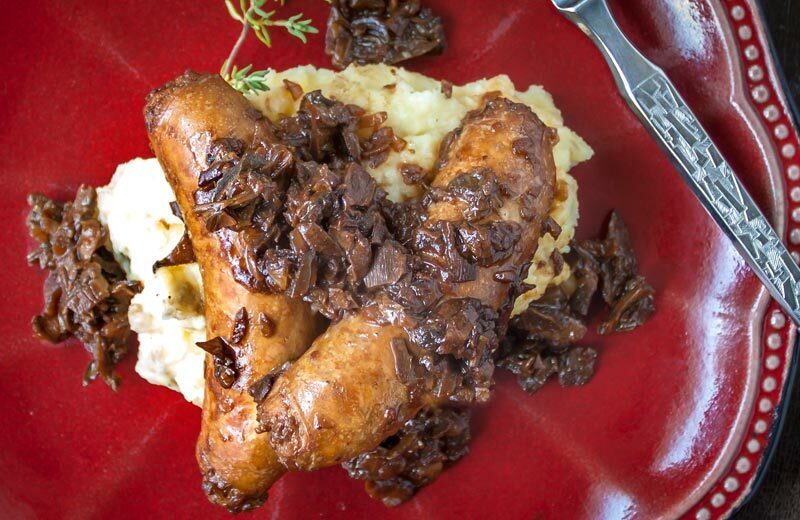 What sets this dish apart is the inclusion of dried mushrooms, simmered along with the sausages in dark beer and the liquid used in their reconstitution. 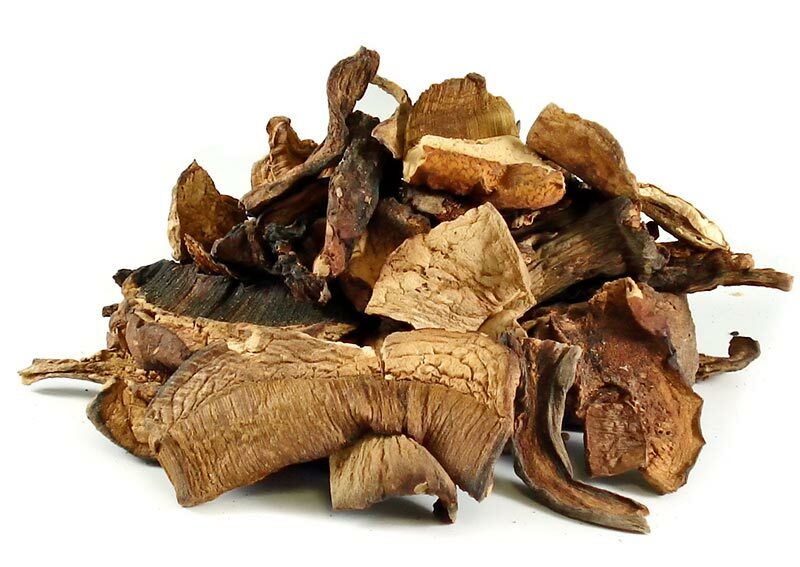 Our preferred mushroom for this recipe is Boletus edulis, a meaty, intensely flavorful mushroom that grows around the world, probably best known by the Italian name porcini. Porcini literally means “little pigs,” apparently so-called for the resemblance to a group of fat little pigs happily rooting across the forest floor. While this mushroom is eaten fresh in season, drying both preserves it without the need for refrigeration, and intensifies the deep, rich mushroomy flavor even more. 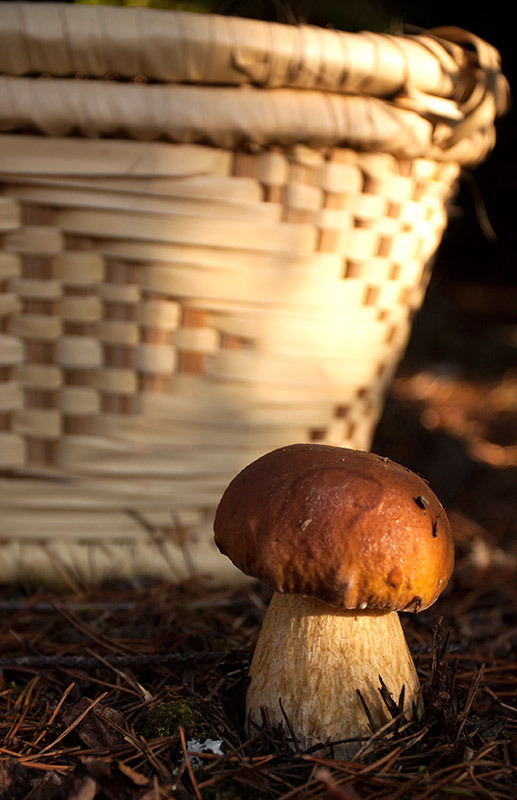 Not a bad name, in fact, for a handsome and delicious mushroom that is indeed fit for a king. Soak the mushrooms for 20 – 30 minutes in a bowl with 2 cups of hot (not boiling) water. When they are soft and pliable, drain them, reserving the soaking liquid. Rinse them gently, but thoroughly in cool running water. Drain again, pat dry and chop coarsely. Set the mushrooms aside momentarily. Allow the mushroom soaking liquid to stand for a while to let any sediment settle. Carefully decant or pour off the liquid, leaving the sediment behind. Alternatively, filter the water in which the mushrooms have soaked through a strainer lined with a paper towel or coffee filter. Set aside. Heat a pan large enough to hold all the sausages in a single layer over medium heat. When hot, add the olive oil and the onions and cook, stirring frequently, until onions are translucent and softened, about 5 minutes. 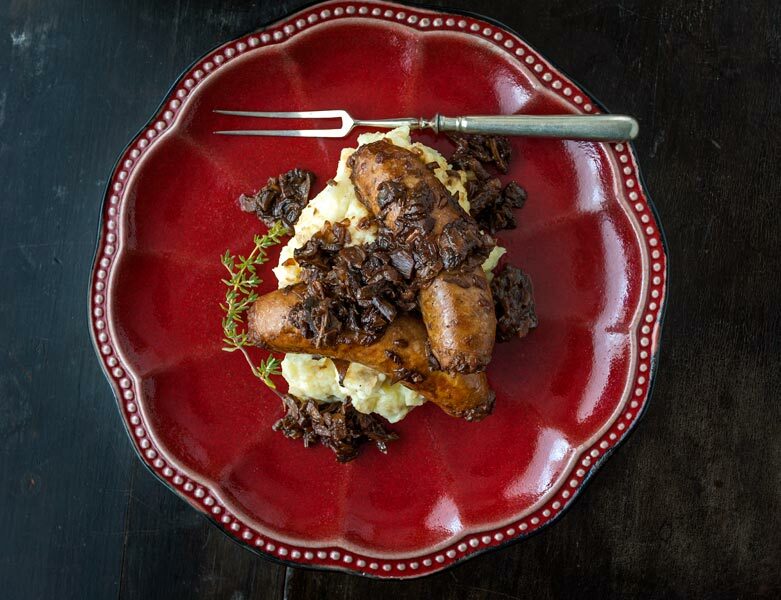 Poke a few holes in the sausage with the tines of a sharp fork to keep them from bursting as they cook. Add the sausage to the pan with the onions, turning to brown well on all sides. Pour in the dark beer and add the thyme sprigs, then reduce the heat so that the beer continues to bubble at a gentle simmer. Turn the sausages from time to time. When the beer has evaporated completely, remove the sausages from the pan and set aside. Add the chopped reconstituted porcini and the mushroom soaking liquid. Turn up the heat until it begins to simmer, then reduce slightly to keep it at a low, gentle simmer. Cook, stirring occasionally, until the liquid has almost completely evaporated. Return the sausages to the pan and simmer for a few minutes, scraping up any tasty bits from the bottom of the pan. Taste and season with salt and pepper. Remove the pan from the heat and tip it slightly, skimming off the excess fat, if any. Serve the sausages over polenta, mashed potatoes, or rice, with the porcini mixture spooned over the top.